We were desperate to go on a cycle tour but were not quite sure what we were searching for. What we did know was that we didn’t want to be anywhere crowded. So, we decided to try for the Outer Hebrides once again. You may remember that in 2015 we got as far as Oban, only to be faced with a forecast of a week of gales and rain. We decided to pull the plug on that visit to the islands; in hindsight, a wise decision! Two years and three major life events later (one sad, one happy, another sad), we felt the need for some wild landscapes, some remoteness, no crowds, no busy roads, some quiet moments, some time to soak up nature and be at peace. The Outer Hebrides seemed the place to go. We stood waiting for the ferry at Oban in torrential rain, slightly apprehensive about what we were letting ourselves in for. There was quite a large group of cycle tourers in the queue; surely we couldn’t all be mad? One of the nice things about travelling on ferries is that, in most cases, those on bikes are first on, first off. We got some seats at the front of the ship so that we had a good, all-round view. Even in the murk and mist, the islands off the mainland looked tantalising and beautiful; some really tiny, others much larger. The further we got from the mainland, the more the weather improved. Unbelievably, the sun even started to shine! We began to get excited. Perhaps the weather would be kind to us after all? But the highlight of the ferry trip was the pod of dolphins we saw leaping joyously alongside the boat. We arrived on Barra and luckily found a tiny space to erect our tent in the busy little campsite at Borve, which was almost full with people who had just come off the ferry. We bumped into the Irish cycle tourer we had chatted to whilst waiting for the ferry, who seemed very knowledgeable about the islands. The reason being, we were to discover later, that he had been visiting the islands twice a year for the past several years. In fact, he seemed quite well known (almost famous, I would say!) amongst other travellers that we bumped into later. That’s the nice thing about travelling by bike: people stop to talk to you. 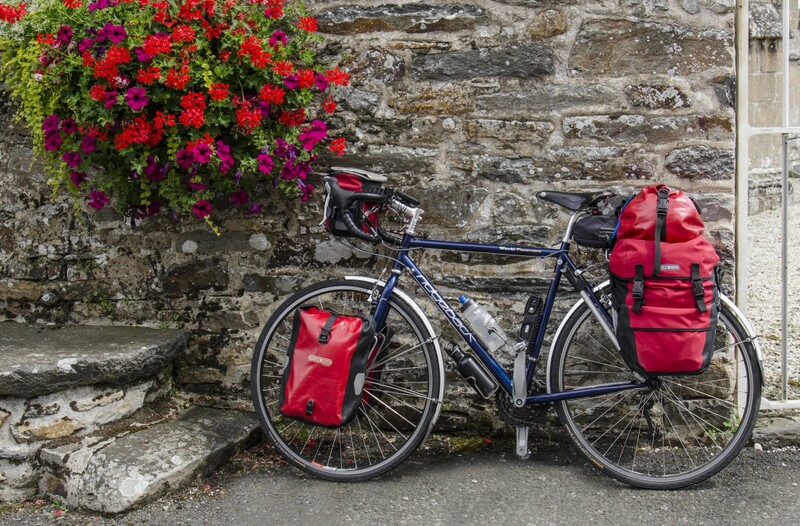 Other cycle tourers share their tips and experiences; we compare gear; talk food and recipes; recommend weather apps; suggest which campsites to avoid, what routes to follow; and pass on information about where there’s a good food store for topping up your supplies. to the gently undulating, almost traffic-free, single-lane roads that taper into the distance. Seeing these islands in sunshine was an absolute delight. We were so lucky. Our favourite cycling day was from the campsite at Balranald, on North Uist, to the island of Berneray. We could not believe the views. We would cycle only a short distance before Mike would say – yet again 😉 – ‘I must stop to take a photo’. We made very slow progress that day! The view from our camping spot at the Gatliff Hostel, Berneray. The 3-mile long West Beach, with its white sand, made up from broken shells, and its turquoise seas, can make you think you are in a tropical paradise (not that far from the truth, apparently, as a photo of this beach was used mistakenly by the Thai tourist board in an advertisement for Kai Bae Beach) – only difference being the temperature! You literally have to drag yourself away from this place. But drag ourselves away we did, as we had to retrace our steps and start making our way back to Barra and the ferry back to the mainland. One of the highlights of our trip was the people we met. Isn’t that the case with every trip? It’s the people you remember, more than the places you’ve seen. Although, in this case, I think the views just pipped it! We so enjoyed camping outside the Gatliff Hostels (Howmore and Berneray) because of all the interesting people we met there. James, our Irish friend, again; Craig, a Scottish cycle tourist/mountain biker/ski mountaineer/all-round mega fit guy; a couple from Malta, who beat us at Jenga; a group of young Americans (who we actually managed to catch up with and overtake on a cycling day – woohoo); on separate occasions, two Brits now living in Australia; a lady from Finland; a cycle-touring couple from Germany … and Piotr and Agata, cycle tourists from Switzerland, who we met at Moorcroft campsite at Carinish. Although only a brief encounter, Mike had a great affinity with Piotr, both being photographers. And we mustn’t forget the wonderful Hector, the driver of the school bus that we had to hire to transport us, our 2 bikes and all 12 of our bags and panniers in the driving rain and 40 mph winds that caught up with us towards the end of our trip. We were out of food, and he kindly waited while we dashed into the Co-op to grab some supplies. Fortunately, the islands had managed to cast their spell on us in the sunny weather that we were blessed enough to have most of the time, but they reminded us of what our trip could have been like by just leaving us with a sting in the tail (see video – link at the bottom)! Categories: Bike packing, Camping, Cycle camping, Cycle touring, cycling, Holiday, Mike McEnnerney, photographer, Photographic, Photography, Scotland, thepedallingphotographer.com, Travel, UK, Vacation | Permalink.